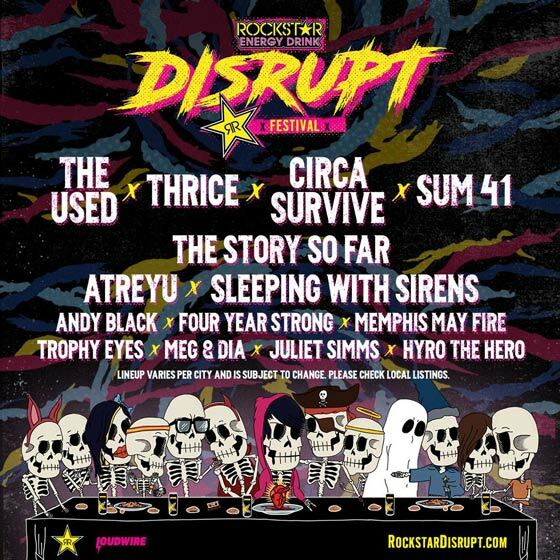 Poised to fill the void left by the drastically shortened Vans Warped Tour, organizers behind Rockstar Energy Drink's Disrupt Festival have announced the event's inaugural lineup. Set to hit 25 North American markets this June and July, acts set to take part in the travelling tour include the Used, Thrice, Circa Survive, Sum 41, the Story So Far, Atreyu, Sleeping With Sirens, Andy Black, Four Year Strong, Memphis May Fire and more. While lineups will vary by city, organizers note that only one band will perform at a time to avoid conflicting set times. The tour will make a lone Canadian stop at Toronto's Budweiser Stage on July 3. That date will feature the Used, Thrice, Circa Survive, the Story So Far, Atreyu, Sleeping with Sirens, Four Year Strong, Memphis May Fire, Trophy Eyes, Juliet Simms and Hyro the Hero. Tickets go on sale this Friday (March 29) at 10 a.m. local time. For now, you can scope the dates below. Further festival details are available here.